Listed as Least Concern on the IUCN Red List. Subspecies Tragulus nigricans listed as Endangered. Asia: Sri Lanka, Malayan peninsula, Indonesian islands, and Philippines. In the undergrowth of lowland tropical forests and mangrove thickets, always near water. Head and body length: 17 to 24 inches (45 to 60 cm). Shoulder height: 8 to 12 inches (20 to 33 cm). Weight: 5.5 to 10 lbs. (2.5 to 4.5 kg). Up to 14 or 16 years in captivity. 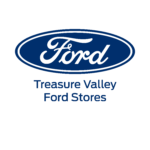 Vegetarian, eating fallen fruit and berries, aquatic plants, leaves of low bushes, and grass. 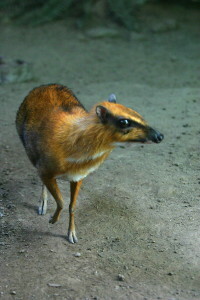 Tiny hoofed mammal, small head, pointed nose, large eyes; long delicate legs about the size of a pencil; short even hair covers body, brown with white underparts, patches of brown under chin. When standing, their hind end is higher than their front quarter. No horns; males have small tusks (elongated canines) in their upper jaw. Males have a large gland on their lower jaw that they rub against females to see if they are ready to mate. When females are not ready, they simply walk away. Will breed year-round with a gestation period of 152 to 155 days and will breed again within twenty-four hours after birth. Offspring (usually one per birth) are well developed when born and are able to stand and be fully active 30 minutes after birth. Young are weaned at 2 to 3 months of age and are sexually mature at 4 to 5 months. Very solitary except during the breeding season. Have very distinct patterns of activity and resting. They create small trails while traveling through the thick brush of the forest. Due to their solitary nature, they have no strict hierarchical structure and fights between males are short bouts of biting with their sharp canines. Very territorial, both sexes mark small and permanent territories with their feces, urine, and secretions from a gland under their jaw. Males will beat the ground with hooves at a rate of four beats per second when agitated or angry. Females tend to stay in their home territory while males move around and usually do not spend more than a year in the same place. Rely on concealment for protection from carnivores such as snakes, birds, and cats. 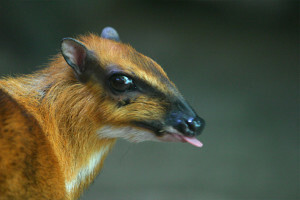 Chevrotains are considered to be the evolutionary link between non-ruminating ungulates, like pigs and hippos, and ruminating artiodactyls, like deer, antelope, and cattle. They are well known to native people as a popular food. The name “mouse deer” refers to its extremely small size, although it is not a rodent or a true deer. “Greater” is in reference to its size when compared to its smaller cousin. They are considered a “living fossil” because they have changed little in 30 million years. Napu is a native name for the chevrotain in Sumatra.